Charlie Greene was born in 1935 in Somerville, Massachusetts. 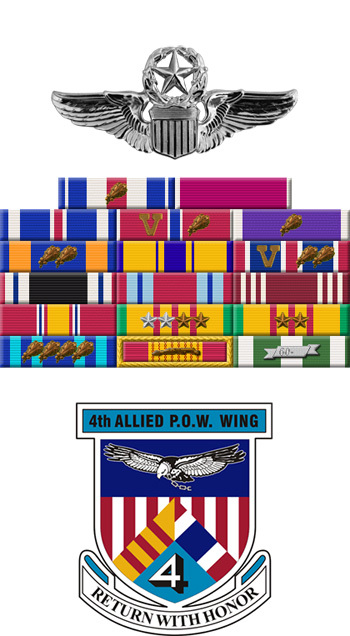 He enlisted in the Aviation Cadet Program of the U.S. Air Force on July 16, 1956, and was commissioned a 2d Lt and awarded his pilot wings on December 5, 1957. After completing All-Weather Interceptor training in June 1958, Lt Greene completed F-106 Delta Dart Combat Crew Training and then served with Air Defense Command from August 1958 to May 1961. He left active duty and joined the Air Force Reserve on May 16, 1961, and then joined the Massachusetts Air National Guard on June 30, 1961, going back on active duty when his unit was activated for the Berlin Crisis on October 1, 1961. Capt Greene deployed with the 101st Tactical Fighter Squadron flying the F-86 Sabre to Phalsbourg AB, France, in November 1961, and returned to Logan Airport, Massachusetts, in July 1962. 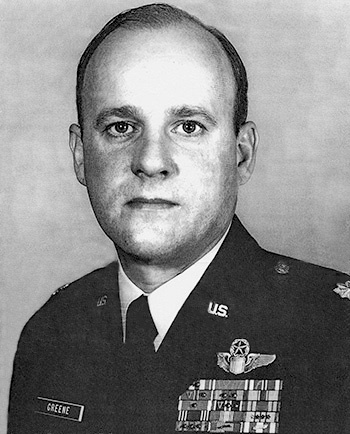 He then served as Assistant to the Senior Air Force Advisor to the 102nd Tactical Fighter Wing of the Massachusetts ANG from August 1962 to February 1963, followed by service as an F-105 Thunderchief pilot with the 336th Tactical Fighter Squadron at Seymour Johnson AFB, North Carolina, from February 1963 to July 1965. His next assignment was as an F-105 pilot with the 7th Tactical Fighter Squadron at Spangdahlem AB, West Germany, from July 1965 to December 1966, and then deployed to Southeast Asia with the 333rd Tactical Fighter Squadron at Takhli Royal Thai AFB, Thailand, from December 1966 until he was forced to eject over North Vietnam and was taken as a Prisoner of War on March 11, 1967. After spending 2,186 days in captivity, Maj Greene was released during Operation Homecoming on March 4, 1973. He was briefly hospitalized to recover from his injuries at Westover AFB, Massachusetts, from March to August 1973, and then received an Air Force Institute of Technology assignment to complete his bachelor's degree at the University of New York from August 1973 to May 1976. Col Greene then served on the staff of Headquarters Tactical Air Command at Langley AFB, Virginia, from May 1976 until his retirement from the Air Force on July 1, 1977. For gallantry in connection with military operations against an opposing armed force as an F-105 Pilot of the 333d Tactical Fighter Squadron, Takhli Royal Thai Air Base, Thailand, PACIFIC Air Forces, in action over North Vietnam on 11 March 1967. On that date, Captain Greene was number four in the Mission Commander's flight; flying wing for the Deputy Mission Commander. This flight was assigned the duty of flak suppression for the strike flights whose target was an iron steel complex. Captain Greene did an outstanding job of calling out flak barrage and Surface-to-Air Missiles to his leader, thus enabling the flight to safely arrive at their target. Captain Greene's repeated attacks through extremely heavy flak barrages and one missile attack enabled him to silence his selected gun site target. By his gallantry and devotion to duty, Captain Greene has reflected great credit upon himself and the United States Air Force.